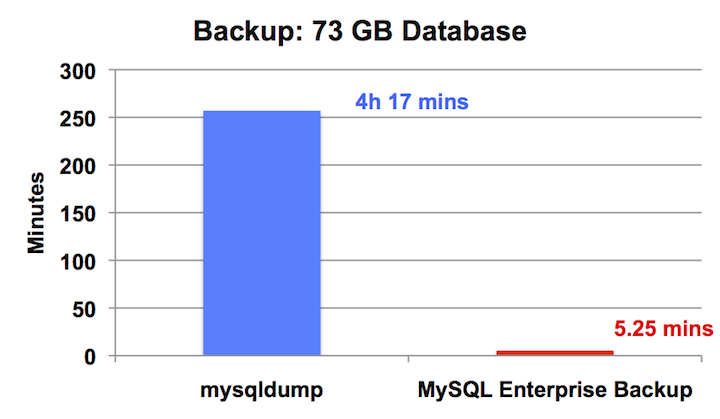 MySQL Enterprise Backup is a backup utility for MySQL servers. It is a multi-platform, high-performance tool, offering rich features like “hot” (online) backup, incremental and differential backup, selective backup and restore, support for direct cloud storage backup, backup encryption and compression, and many other valuable features. A hot backup is a backup performed while the database is running. This type of backups does not block normal database operations. It captures even changes that occur while the backup is happening. Comparing to the other backup types, it causes the least disruption to the database server, and it is a desirable backup option when you want to avoid taking your application, web site, or web service offline. A warm backup is a backup performed with the database put under a read-only state. This type of backups blocks any write operations to the tables during the backup process, but still allow tables to be read. When connected to a running MySQL server, MySQL Enterprise Backup backs up all MyISAM and other non-InnoDB tables using the warm backup technique after all InnoDB tables have already been backed up with the hot backup method. A differential backup includes all changes to the data since the last full backup. It is faster than a full backup, saves storage space on the database server, and saves on network traffic when the backup is being transferred to a different server. The files, as they are originally copied, form a raw backup that requires further processing before it is ready to be restored. You then run the apply step (either as part of a copy-back-and-apply-log command or a backup-and-apply-log command, or as a separate apply-log command), which updates the backup files based on the changes recorded in the ibbackup_logfile file, producing a prepared backup. mysqlbackup also backs up the .MYD files, .MYI files, and the .frm files associated with the MyISAM tables. backup-my.cnf: Records the crucial configuration parameters that apply to the backup. These parameter values are used during a restore operation, so that the original values are used regardless of changes to your server’s my.cnf file since the backup. MySQL Enterprise Backup now supports optimistic incremental backup, in which mysqlbackup scans only those InnoDB data files that have been modified since the last backup for changed pages and then saves them into the incremental backup. It potentially makes incremental backups faster. Apply-log operations can now be performed with multiple worker threads in parallel, which can improve performance for the operations. The number of threads to be used can be specified with the –process-threads. Path to MySQL configuration file : Default system locations, hardcoded application default locations, or from the –defaults-file option in the mysqld startup script. MySQL port : MySQL configuration file or mysqld startup script. Path to MySQL data directory : MySQL configuration file or mysqld startup script. Size of InnoDB redo log files :Calculated from the values of the innodb_log_file_size and innodb_log_files_in_group configuration variables. Use the technique explained for the –incremental-with-redo-log-only option. As you can see, the backup was created in /mnt/backup/hotbackups. If I wanted to have a unique folder for this backup, I can use the –with-timestamp. You can check the integrity of your backup using the validate command. Copyright (c) 2003, 2017, Oracle and/or its affiliates. All Rights Reserved. 170214 17:46:09 MAIN    INFO: Creating 14 buffers each of size 16777216. 170214 17:46:10 MAIN    INFO: datadir/mysql/time_zone_leap_second.ibd validated. 170214 17:46:10 MAIN    INFO: datadir/mysql/time_zone_name.ibd validated. 170214 17:46:10 MAIN    INFO: datadir/mysql/time_zone_transition.ibd validated. 170214 17:46:10 MAIN    INFO: datadir/mysql/time_zone_transition_type.ibd validated. 170214 17:46:10 MAIN    INFO: datadir/pets/cats.ibd validated. 170214 17:46:10 MAIN    INFO: datadir/sys/sys_config.ibd validated. 170214 17:46:10 MAIN    INFO: Validate operation completed successfully. 170214 17:46:10 MAIN    INFO: Backup Image validation successful. Delete all files inside the server’s data directory. If the data directory is not empty, you have to use the –force option to allow overwriting of the old data, or mysqlbackup will error out. Use, for example, the copy-back-and-apply-log command, which converts the raw backup into a prepared backup by updating it to a consistent state, and then copies the tables, indexes, metadata, and any other required files onto a target server. If you are not sure about those settings for your backup, they are stored in the backup-my.cnf file during the backup—you can find the file either in the temporary directory you specified with –backup-dir when you created the single-image backup, or in a backup directory you can create by unpacking the backup image using the extract command. that case you need to add 'innodb_data_file_path=ibdata1:12M:autoextend' to the target server configuration. 170214 22:11:38 MAIN WARNING: If you restore to a server of a different version, the innodb_log_files_in_group parameter might have a different default. In that case you need to add 'innodb_log_files_in_group=2' to the target server configuration. at case you need to add 'innodb_log_file_size=50331648' to the target server configuration. 170214 22:11:38 MAIN    INFO: Keyring service not initialized. MEB cannot validate the encryption keys. 170214 22:11:38 MAIN    INFO: Valid keyring to be specified on server start to access the encrypted tables. 170214 22:11:40 MAIN    INFO: Writing config file for server '5.7.17'. 170214 22:11:40 MAIN    INFO: Copy-back operation completed successfully. 170214 22:11:40 MAIN    INFO: Creating 14 buffers each of size 65536. 170214 22:11:40 MAIN    INFO: Using up to 100 MB of memory. 170214 22:11:40 PCR1    INFO: InnoDB: Doing recovery: scanned up to log sequence number 2543132. 170214 22:11:40 PCR1    INFO: InnoDB: Setting log file size to 50331648. 170214 22:11:45 PCR1    INFO: InnoDB: Setting log file size to 50331648. 170214 22:11:50 MAIN    INFO: Apply-log operation completed successfully. 170214 22:11:50 MAIN    INFO: Full Backup has been restored successfully. Depending on how you are going to start the restored server, you might need to adjust the ownership of the restored data directory. This command creates a single backup image on the given absolute path. It still requires –backup-dir, which is used to hold temporary output, status, and metadata files. The following command streams the backup as a single-file output to a remote host, where it may be saved directly to a tape device. –backup-dir=/tmp designates the directory for storing temporary files rather than the final output file. To calculate the size of the redo log, issue the command SHOW VARIABLES LIKE ‘innodb_log_file%’ and, based on the output, multiply the innodb_log_file_size setting by the value of innodb_log_files_in_group. To compute the redo log size at the physical level, look into the datadir directory of the MySQL instance and sum up the sizes of the files matching the pattern ib_logfile*. The incremental backup feature is primarily intended for InnoDB tables, or non-InnoDB tables that are read-only or rarely updated. Incremental backups detect changes at the level of pages in the InnoDB data files, as opposed to table rows; each page that has changed is backed up. You cannot perform incremental backups with the –compress option. In the following example, the –incremental-base=history:last_backup option is used, given which mysqlbackup fetches the LSN of the last successful (non-TTS) full or partial backup from the mysql.backup_history table and performs an incremental backup basing on that. You can only use the –compress option for full backups, not for incremental backups. The backup compression feature works only for InnoDB tables. After the InnoDB tablespace files are compressed during backup, they receive the .ibz extension. Including or excluding specific tables by their names. This uses the –include-tables or –exclude-tables option.Including some or all InnoDB tables, but not other table types. This uses the –only-innodb option. Note : Typically, a partial backup is more difficult to restore than a full backup, because the backup data might not include the necessary interrelated pieces to constitute a complete MySQL instance. In particular, InnoDB tables have internal IDs and other data values that can only be restored to the same instance, not a different MySQL server. Always fully test the recovery procedure for any partial backups to understand the relevant procedures and restrictions. The –only-innodb and –only-innodb-with-frm options back up InnoDB tables only, skipping those of other storage engines. You might also use them together with the –include option to make selective backup of InnoDB tables while excluding all other files created by other storage engines.